Behind great companies stand great people. People, whose decisions have the power to bring a business to the top of the food chain, or set it ablaze leaving nothing but ash. These are the people we will be honoring today, and the most significant, most influential individual among them will be presented with our “Person of the year” award. Today, we are looking for a person who is far more than just hardworking and dedicated. The winner in today's category should serve as an example of how a company should be operated and should be an inspiration to free-thinking individuals. They also need to have proven that they are capable of making the right choices in the right moments. By the way, we have already announced the winners in nine other categories, so in case if you have missed any of them, feel free to take a look. Even though he is no longer among us, Steve Jobs will always be credited as the genius, whose ideas changed the smartphone industry. He was the one responsible for the existence of the iPhone and the iPad, both of which are devices praised by millions of people worldwide. He was the one who lead Apple on its way to becoming one of the most valuable companies in the world today. He was the one who revolutionized personal computers and portable media players by making them fun, beautiful, and easy to use. Undoubtedly, the legacy of Steve Jobs will live on for generations despite the unfortunate event of his passing, which is why he well deserves to be pronounced “Person of the year”. Andy Rubin, Senior Vice President of Mobile at Google, is the man who we should thank for having Android today. His endless efforts to keep the platform on track are the reason why the little green robot is present on millions of smartphones and tablets worldwide, and over half a million new ones join the party every day. Of course, coordinating the development of Ice Cream Sandwich is another feat he is credited for, and the results from his great work are yet to be felt with the platform's expansion. Jeff Bezos, CEO of Amazon, deserves to be mentioned today for bringing the Amazon Kindle Fire to the market – a game-changing product that proved that a great tablet does not need to be expensive. Thanks to its $200 price tag and broad range of features, the slate has been selling by the boatloads putting its pricier counterparts to shame. Not to be forgotten is the Amazon App Store, which opened for business under Mr Bezos' guidance and quickly became one of the hottest alternatives to the Android Market. There you go, folks! Steve Jobs wins our “Person of the year” award, followed by Andy Rubin and Jeff Bezos. 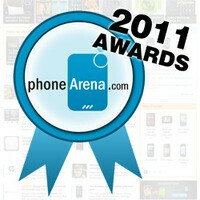 However, the PhoneArena Awards of 2011 are not over yet, and the most exciting categories have yet to come. Stay tuned, as the next one will be announced no later than tomorrow! I respect Steve Jobs and appreciate everything that he has done for technology as a whole whether it is phone or film and may he rest in peace however, if it wasn't for his passing, he wouldn't have received this award IMO. He didn't do much THIS YEAR. true. andy rubin is the man who changed the mobile landscape. If it was up to Rubin, android would have been a RIM clone. The earliest HTC android prototypes were copies of RIM devices. He would've eventually changed, this is person of the year btw, not "greatest person who ever lived", Andy Rubin deserves respect because his endless efforts to the platform on track, just like phonearena said. As I stated before, android success to date is due to Google's vast resources. If Rubin got hit by a truck tomorrow and dies, Google's vast resources will continue to pump out new versions of android. People will be more impressed with Rubin if he pulled a Linus from the creator of Linux. you can state whatever u want, that doesnt make it correct. Android's success lies in its design. It was designed to be pliable. Its like putty.. you can mold it to pretty much any design and purpose you can think of... which is in stark contrast to iOS. Honest reality, NONE of those people deserve to be up there. SJ didnt do squat this year, and other than take credit for everyone elses work, what has he actually done in the last 5? Rubin started Android, but what did he do this year.. personally? And same goes for everyone else in nomination. The only thing these guys have in common is they are the head's of their company/department and their company has had a pretty successful year. The real "person of the year" is someone we have never heard of, because they are doing all the work, coming up with all the ideas, but because of the way business works, they get none of the credit. The company owns whatever Ideas they think up. And who gets to take public credit for that? The CEOs... aka Jobs and Rubin and the rest. Why do poster here choose to ignore reality. Just yesterday there was an article that android was being designed with a trackball in mind. When iPhone came out they changed coursed. It was Apple who ignited the touchscreen craze and android obviously followed suit. They rushed it though and never optimized the OS for touch. You comment about android initial design is correct. recent because there was not a single good device out there to give a good touch experience. After seeing the iPhone success in this area they (Google) just change the direction of the OS. that's it. When computers were developed they were the size of rooms, when motorola was developing cell phones they came in bags, ideas change over time. Also how is Android "never optimized" for Touch? I mean with the exception of the menu and home button in most apps that's all you need to use? Disregarding of course that Honeycomb/ICS doesn't even any solid buttons on the front need, because the home button is part of 3 relatively stationary on screen keys. Sure Android was a work in progress, but that doesn't mean that it can't become hands down the greatest handset OS out there, cause it certainly has that ability. Hell Apple has already started implementing several key android features into it's OS cause they're great ideas. Android was designed to be on ANYTHING. That was the purpose of android. As they said themselves, android was designed as a phone second and a computer first. Steve Jobs didn't do much THIS YEAR was because he was dying. Despite poor health, he continued to work as much as he could at the company he founded. SIRI is clearly a game changer. Rubin didn't do much either without Google's vast resources. Google is responsible for android in its current form. Bezos will go down in history for selling a crappy 7" tablets at a loss in 2011. The return rates for the Amazon Fire has been estimated as high as 15% or more. The issue is about people of the year. Stick to the topic as in stay on topic if you possess that ability or perhaps that's a bit too challenging. Siri is not a game changer. It's a marketing gimmick. It's not a spec. It's an application. It is a game changer because it changes the way smartphones will be used in the future. It brought AI to the consumer masses. Spec's are overrated, which is why ZTE or Huawei will take share from Samsung in the android space in the future. There is NO spec that ZTE or Huawei can't get access to by using alternative products. Do you seriously think Jobs was writing code for SIRI? Or even really came up with the idea? I'm sure he gave it the OK to include or spend more money researching it, but that's the CEO's job. I get the idea of giving the man representing the company credit for a company's find in this type of poll, but if Jobs hadn't passed he wouldn't have won this poll. It's not a shame to admit it really, I mean it's happened in other votings as well, just the nature of human emotion I guess. baahahah. You think Siri is AI?? Ardent, as pretentious and intelligent as you want to keep trying to tell people u are, u should know what AI is and how far Siri is from AI. Being able to recognize the same command 3 different ways is not AI, its extra scripting. yea, how about the employees that actually come up with the ideas, the employees that actually code in and impliment the ideas, or even the laywers that come up with these ridiculous arguments that we are so fond of watching. SJ has done none of that.. but yet you give him credit for all of it. Great.. he nitpics colors of icons on sunday mornings.. woo hoo.. give him the nobel peace prize too. He has done more than Obama and Gore, so he obviously deserves that too. BTW, Apple lost their stupid arguments. And stupid is the right word after they gave Samsung advice on how to build a device that they wouldnt say is infringing on them. Steve Jobs man of the year lol! If they're going to make it an Apple thing like PA loves to do then make it the real person behind the design of it and not the person doing the marketing of it. Steve Jobs was really nothing more then a glorified door to door sales man. or they should change name to "iperson of the year"
The design is made by jonathan ive. And he worked closly with Steve jobs. And phill chiller is bere to do the world wide marketing of apple not steve jobs. Are you rly that stupid? If you think Steve Jobs didn't developped their products with the others, then you're info is incorrect. Yea and it was Steve Jobs who came up with the iPod the very first mp3 player! What's your problem? You don't know how apple is runned. You even thought that steve jobs did all the marketing. Wich says about your knowledge being low. And I can't remember them saying it was the very first. Pls do me a favor and watch the keynote of the iPod revealed. Then at least you will say correct info. I can't say what's different between mp3. Then I need to write sth longer. First runned isn't a word. Steve Jobs was just a sales man. Do you really think a president of company has the time to do designs on every product? They don't Apple says this stuff to make you guys think this stuff. You have to be a real fanboy to think that he does more then just say this is a good product now let me go talk with the people who have their heads up their asses to far to notice we haven't done crap in about seven years. Uzzelien, you're being unctuous on purpose. And if you think Steve Jobs was just a salesperson, then you are ignorant and unctuous. actually.. like most things apple ... the idea Idea and design of the iPod was stolen... umm. Eeeerr.. creatively borrowed from another poor soul.. who not only did they admit to stealing his ideas,they used his original design drawings for patent defence, and still refused to pay him a dime.